The Feecon Remote Manual Dual Roof Turret is a manually operated foam and water turret, mounted on the vehicle cab roof, for Aircraft Rescue Firefighting (ARFF) vehicles, capable of discharging water or AFFF solution at flow rates up to 1200 GPM (4545 LPM). The turret is directly controlled from the interior of the vehicle cab and has manually operated rate and pattern control levers and an electric over pneumatic discharge valve located within easy reach of the operator. A versatile feature of the Remote Manual Roof Turret is electric/pneumatic discharge valve actuation along with manual override capability in the event of power failure. All turret operational functions – turret discharge pattern, rate, rotation, elevation/depression and discharge shutoff valve are located and controlled within the vehicle cab. The turret air supply is provided through the vehicle at a recommended pressure setting of approximately 100 psi (60 psi minimum – 130 psi maximum). The water/foam supply inlet connection accepts a 5” victaulic coupling only. The turret has a dual flow rate nozzle, that is, full fl ow and half flow rates. Output wires are provided for throttle activation and signaling the foam proportioning system multimetering valve. 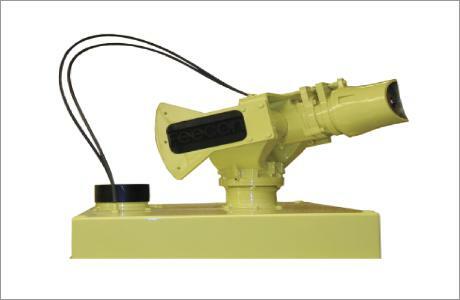 Remote Manual Turrets from Feecon are designed to meet the requirements of NFPA 414 Standard for Aircraft Rescue and Fire Fighting Vehicles and FAA Advisory Circular 150/5220-10A Guide Specification for Water/Foam Aircraft Rescue and Firefighting vehicles.